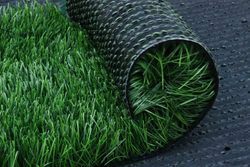 Wholesale Trader of a wide range of products which include artificial grass. Our domain is related to Artificial Grass wholesale and trade business, this is require to enhance the beauty of garden in stadium complexes, museum garden and big sport complexes. Though it is not natural grass, but it gives a feeling of natural grass. It is eco-friendly in nature and does not require any special care for its growth. Top at all, it last for longer period of time doesn’t get fade with time, heat and heavy usage. Looking for Bison Turf Artificial Grass - Turf ?